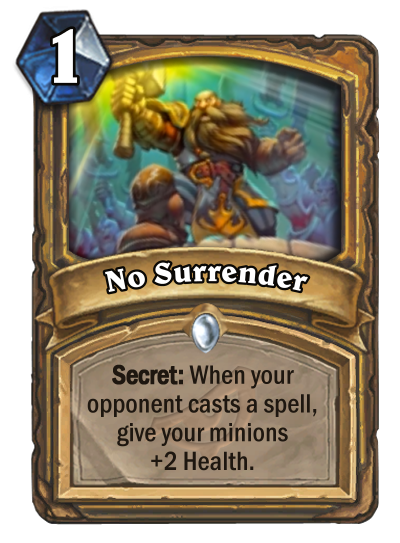 New Paladin Card - Never Surrender! Maybe a good card in the wild but right now I don't see any chance that it will see play in standard. Secret Paladin relied incredibly heavily on Divine Favor...So I'm not sure it survives the rotation. That said, if it does survive, this is great protection against AOE. You make your opponent's life really difficult with a combination of this, noble sacrifice, redemption, and auto-defense. It's hard to get a read on all of them. As far as paladin secrets go, it's pretty good. But paladin secrets are notoriously awful if not hard carried by broken cards like Mysterious Challenger or Divine Favor (or both). this card should be very good in wild, but not so much in standard. But we all know that secret pally can strike from behind, so i wouldn't count this one out. Tempo secret, so that is good. Might be good to play around aoe and removal. Coin triggers the secret, big plus. But it won't be too good against aggro and midrange since they don't play many spells and that is my biggest concern. So I think the card is average overall. very good because every oppovent now must think about "work my AOE well ?" "When your opponent..." has a clear meaning. The secret is resolved before your opponent's card. Hence Equality still changes all healths to 1. Lol all these ( this card will be good in wit people) inb4 it is gonna be cried about in forums. When does "when" trigger, with regard to resolution of AOE spells? It's certainly not a brainless secret that just works whenever, but that doesn't mean it can't be good. Will be good for wild. We'll have to see how standard is. Think we'll be seeing fewer, but bigger minions with odd/even gone, which will make this kinda meh.